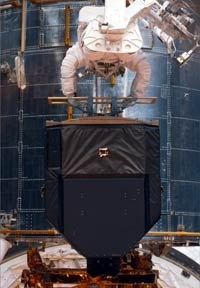 Hubble has three Fine Guidance Sensors (FGS'es) onboard. Two are used to point and lock the telescope on the target, and the third can be used for position measurements - also known as astrometry. Because the FGS'es are so accurate, they can be used to measure stellar distances and also to investigate binary star systems. The three FGS'es are located at 90-degree intervals around the circumference of the telescope. Since Hubble needs very high pointing accuracy the FGS'es have been constructed as so-called interferometers that take advantage of the wavelike features of the in-coming starlight. So they can search for a wobble in the motion of nearby stars that could indicate the presence of a planetary companion, determine if certain stars really are double stars, measure the angular diameter of stars, galaxies, etc.